What Does It Take For Us To Believe? If you don’t mind I’d like to start by conducting a straw poll with a show of hands. There are two main choices, but possibly an infinite number of circumstances and experiences that could fall into either of those categories. I want you to think about your journey to faith, from when you first took an interest in Christianity to a point when you knew you believed. I wonder whether this was a sudden and datable experience or whether it was more of a gradual process, where you can perhaps remember a time when you didn’t believe and now you do but you don’t know exactly when that happened. Perhaps you’ve always believed or maybe you’re still on that journey. None of these choices are better than the other, but it would be interesting to know, if you’re willing to share. Put your hands up [Reader, you too can join in, although remember that statistically the result will be 100% for whichever choice you raise your hand to] if your belief followed a sudden, ‘Damascus road’ type experience…… and now if your belief has been more gradual…… We’re actually quite representative of the average, which is about three-quarters describing it as gradual and a quarter as sudden. I’d actually quite like to stop and hear from some of you about your journeys but I suppose I better carry on… because the really interesting bit might not be when it happened for those already there, but what it takes for us to believe. For Thomas it was the sheer physical proof of placing his hands on a man with whom he had spent the best part of the last three years and who he knew had been crucified, had died and had been shut up in a rock tomb and was now according to his friends and fellow disciples very much alive again; a man who was speaking to him and asking him not to doubt but to believe. 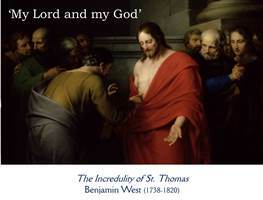 This apparently indisputable proof led Thomas to publicly declare that Jesus was indeed ‘My Lord and my God’. Where then does it leave those of us who will probably never have the opportunity to physically encounter Christ, at least not in the same way that those first disciples did? We are told that we are blessed more if we come to believe without seeing. Do we, therefore, come to belief because there are first-hand witness statements available to this event? 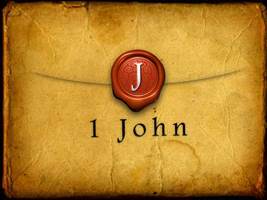 We don’t know for sure who the author of the first letter of John was, but from the very earliest of times it was believed to have been written by John, the fisherman and apostle of Jesus and bears striking similarities to the Gospel of John. Here is someone writing to one of the first group of Christians, who are somewhat unsure as their faith is being tested by spurious claims about whom Jesus really was; that he wasn’t actually human and didn’t really suffer on the cross; that he only ‘seemed’ human. John writes to reassure these believers, that as a first-hand witness of Jesus’ ministry he and his friends saw and heard and touched Jesus when they became his disciples and shared his life. In this way their testimony is very convincing – they believed that Jesus was none other than the ‘Word’ of God – the source and meaning and purpose of life. Even so, an eyewitness account is not quite the same as having concrete facts and figures, to inform our belief. Now before you get too excited I am not going to pull the ‘white rabbit’ of incontrovertible evidence out of my theological training ‘top hat’ but in amongst the minutia of historical data plenty of scholars and historian have investigated what might be myth and what could be reality. We know that without a resurrection Christianity is counterfeit. 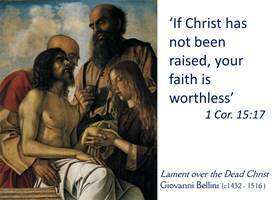 As the apostle Paul tells the Corinthians, ‘If Christ has not been raised, your faith is worthless’ 1 Corinthians 15:17. Accordingly, since a resurrection requires death, Jesus’ death by crucifixion has to be regarded as true. This ‘fact’ is attested to by a number of ancient sources, including the non-Christian historians, Josephus and Tacitus, who were therefore not biased toward a Christian interpretation of events. We know that the chances of surviving crucifixion were very bleak and no evidence exists that Jesus was removed whilst still alive. The unanimous professional medical opinion is that Jesus certainly died due to the rigours of crucifixion, and even if he had somehow managed to survive, it would not have resulted in the disciples’ belief that he had been resurrected. What about the empty tomb? Well its location was known to Christians and non-Christians alike. 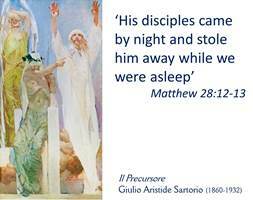 So if it hadn’t been empty, why would the chief priest have devised a plan to give a large sum of hush money to the guards, telling them to say that ‘His disciples came by night and stole him away while we were asleep’ Matthew 28:12-13. It would also have been pretty impossible for the large group of believers to have suddenly sprung up in the same city where Jesus had been publicly executed just a few weeks before and for those same believers to have been willing to die brutal martyr’s deaths if they knew this was all a lie. Were people hallucinating when they encountered the risen Christ? Well, usually hallucinations are something that happens in an individual’s brain and not repeatedly on separate occasions and certainly not to groups of up to 500 people! 1 Corinthians 15:6 Even if they were visions, brought on by the apostle’s grief over the death of their leader, surely the body would have still been in the tomb. Convincing facts and figures? Well maybe. Or perhaps Pascal’s Wager might be the reason why people believe. 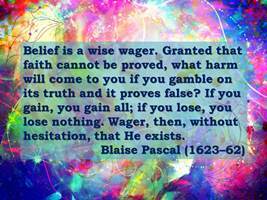 Pascal was a seventeenth-century philosopher who theorised that humans live their lives by wagering that believing in God is a good bet because if when they die he does exist then they have gained the best of everything, on the other hand if they don’t believe and then find out he does exist then they made the worst choice and will have lost everything. However if they were to discover after death that God never existed then it didn’t matter what you believed. So by believing, you are in a win-win situation. This sort of hedging my bets is just one accusation made against Christians who assume that because they believe in the right God, they are automatically good and have a one-way ticket to everlasting life. However, it also assumes that God would always reward blind faith above living a conscious Christ-centred life and all of the obligations that that might bring. 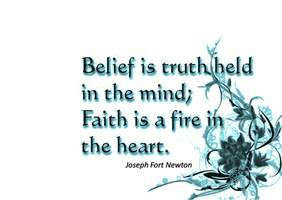 Perhaps belief and faith are different then… that belief is something that our logical, human minds hold to be true whilst faith is something that is felt deep within our hearts. Or could it be that faith is based on belief and that is why faith alone is not possible because belief always brings about actions and reactions? I hope you’ve been aware that I’ve been careful to never actually define what it is exactly that we understand and count as belief. Some might say that’s a cop-out; that the church is forever allowing so much laissez-faire around declaring what it believes and stands for that it nullifies any claims it might have to the truth. Well, I’m sure that for the majority of us it will include the belief that Jesus died and was resurrected in order that we might ‘have life in his name’, but that for each of us that might mean something slightly different depending where we are on our journey of faith. As we walk together in fellowship with each other and with God, let’s make sure that we’re not only helping each other to increase in faith, but that we are sharing our beliefs with others so that God’s joy may be complete. 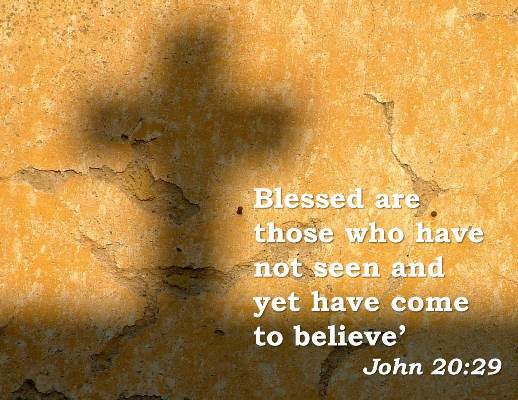 After all didn’t Jesus say ‘Blessed are those who have not seen and yet have come to believe’. So let’s go and open a few more eyes to the truth of what we believe. This entry was posted in Ministry and tagged 1 John 1:1-2:2, Acts 4:32-35, apostles, belief, believe, blessed, Christ, Christianity, Christians, Corinthians, crucifixion, Damascus Road, death, disciples, Easter, evidence, eyewitness, faith, Father, fellowship, God, hallucination, heart and mind, Holy Spirit, Jesus, John 20:19-end, Josephus, journey, Lord, martyr, myth, Pascal, proof, reality, resurrection, Second Sunday of Easter, sermon, Son, Tacitus, Thomas, tomb, vision, wager, witness, Word on April 12, 2015 by lindasgalvin.